Watermelon Cellophane Roll 24 inches wide x 50 ft long. 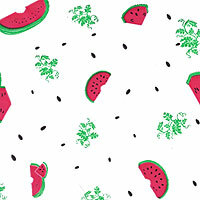 Fun Watermelon design with traditional colors. Greenery, vines and seeds scattered among the cuts of ripe red watermelon. What a fun design for the summer or a fruit basket! Background is clear.